After the terrorist attacks on the World Trade Center, rescue workers searched through the debris to find survivors, as well as the bodies of those who were killed. Sixteen acres of New York’s business district was covered with ash. Crews came in to begin cleaning away the rubble. In Washington, D.C., President Bush and other leaders took a hard stance against the terrorists. Intelligence sources quickly traced the attacks to Osama bin Laden, a Saudi Multimillionaire. Bin Laden was the leader of an international group called Al Qaeda. This group had organized other terrorist attacks, such as the 1993 attacks on the World Trade Center and the 1998 attacks on U.S. embassies. An extremist Muslim group – the Taliban – supported and protected bin Laden, who was hiding in Afghanistan. American leaders asked the Taliban to turn bin Laden over to them. When the Taliban refused, America, Britain, and several other nations launched air attacks on Taliban strongholds. Neighboring Pakistan aided the allies. Afghan troops launched ground attacks against the Taliban and were joined in December, 2001, by U.S. ground troops. The fight took troops into the mountains and caves of Afghanistan, searching for bin Laden. Additionally, the U.S. asked other governments to freeze the financial assets of all terrorist groups. Without access to their money, terrorist groups couldn’t function. In 2002, President Bush’s administration tried to build an international coalition to shut down terrorist groups around the world. At first, their plans seemed to be going well, but several Arab countries refused to cooperate. These countries were unhappy with America’s support of Israel. The government developed much stricter regulations for airline travel. Question: Was the war on terrorism successful? Answer: Not particularly. Fighting terrorists is different from fighting more traditional opponents. Terrorists don’t care if they die and they generally don’t have clear goals, other than causing destruction. Terrorism is still a problem today. The Twin Towers were not rebuilt after the attacks. Instead, a memorial and park were built there. Learn more about visiting it. Declan, Tobin. " 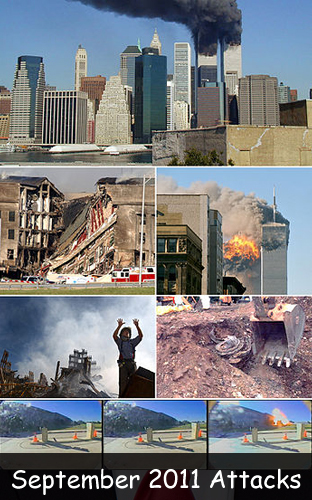 Facts for Kids about 9/11 - American Response ." American History for Kids, Apr 2019. Web. 21 Apr 2019. < https://www.americanhistoryforkids.com/responding-to-911/ >.